NOTE: If you see the full text of this post on any site but this one, it has been reprinted without my permission. 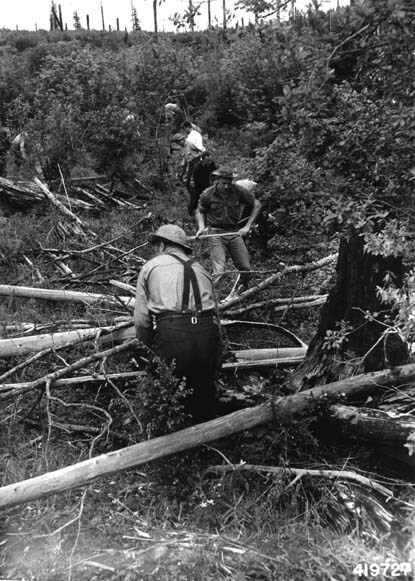 Conscientious Objectors using hand tools to create a fire line. The Green Family, owners of the Hobby Lobby chain of craft stores, has asked the US Supreme Court to grant them 'conscience protection,' exempting them from their obligations under the Affordable Care Act. They claim that their religious convictions don't allow them to cover employees' birth control. As it happens, I know a little something about conscience protection. I'm a Quaker--one of the groups for whom the first conscience protection laws were created. As a Quaker, I believe in Conscience Protection. I believe people should have the right to refuse work that violates their principles. If a draft were called tomorrow, I would wholeheartedly support people's right not to serve. A pharmacist demanding the right to keep their job even if they refuse to dispense legal medication is like a Marine demanding to keep their job even if they refuse to follow lawful orders. That's not "conscience protection," that's a handout to someone who wants to be paid not to work. I feel the same way about Hobby Lobby's Affordable Care Act stunt. I will refrain from asking where Hobby Lobby gets the nerve to claim 'conscience' when their shelves are full of products from countries with appalling labor laws. I won't even ask which version of the bible they're reading where Matthew 25.36 reads "I was sick and you sued not to cover my medical care." Instead, I want to know exactly where they're getting the idea that conscience protections are a consequence-free exemption from legal obligations. During World War II, men who refused conscription for reasons of conscience didn't get to go back to their normal lives. They were conscripted instead for difficult, dangerous jobs. They served as forest fire fighters (including smoke jumpers), psych ward orderlies, and subjects in medical testing. That program formed the basis of the Alternative Service Program used during the Korean and Vietnam wars. If a draft were called tomorrow, the Alternative Service Program would start right back up again. And Alternative Service applies to work that people are required to actually carry out themselves, not to things they're only required to pay for. Every year, I pay taxes to the United States government. I tell myself that I'm paying for roads and schools; food for hungry families and head start programs. I am, of course. But I'm also paying for Guantanamo Bay. I'm paying for two wars, and for racist immigration laws. I'm paying for drone strikes, including those that kill and maim children. I'm paying for federal executions, and for lawyers to argue that the government is not obligated to provide comprehensive medical care to Chelsea Manning. I'm paying for the prison industrial complex. All of those things violate my religious beliefs. And if I refused to pay my taxes because of that? I would go to jail. There are Quakers whose consciences really won't permit them to pay federal taxes. Many of them manage that by making sure they don't make enough money to incur tax liability. They live on far less than they could earn if they were willing to pay taxes, but they're willing to make that sacrifice, because their conscience demands it. Now along comes Hobby Lobby, demanding a consequence-free exemption to paying for birth control on the grounds that it violates their conscience. If your conscience prohibits you from dispensing legal medication, then your conscience prevents you from being a pharmacist. Full stop. If your conscience prohibits you from performing abortions, then your conscience forbids you from taking a position where abortions are part of the job. Full stop. I know firsthand that it can be hard to pass up opportunities that violate your conscience. But that is the price you pay for conscientious objection. If you're not willing to pay that price, you're not a Conscientious Objector. Full stop. If the Green family's conscience really forbids them from meeting their legal obligations under the Affordable Care Act, then they have the option to arrange their lives so as not to incur those obligations. They can choose not to run a two billion dollar corporation. But if they're not willing to make those sacrifices--if their 'conscience' only compels them so far as they can follow it for free--then they are not conscientious objectors. And they and their fake conscience objection can get the hell off my lawn. Posted on November 26, 2013 by Annalee Flower Horne and tagged current events quakerism.